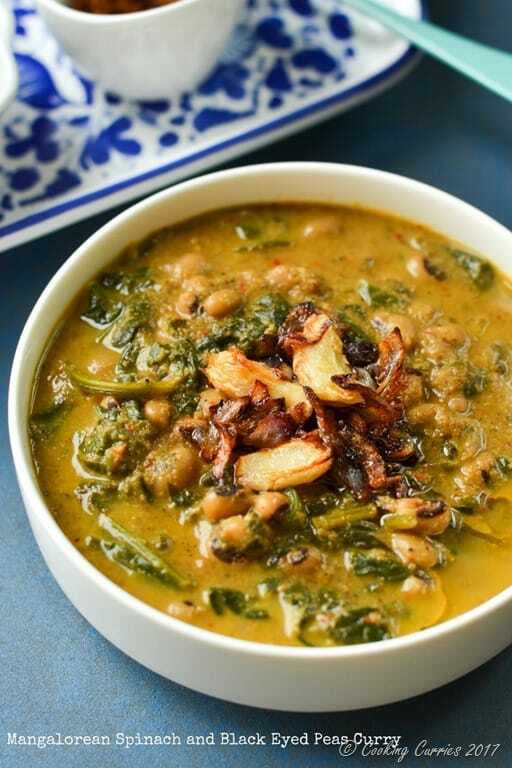 Garlicky, spicy and creamy curry with Spinach, Black Eyed Peas Curry and Coconut. It is so good and comforting that you can just slurp spoonsful of it from the bowl! Inspirations. They are everywhere. You just need to act on them, that’s all. I have this bad habit of scrolling though other food blogs or foodie Instagram accounts just before I go to bed. All the gorgeous and delicious food photographs I see makes me hungry and invariably I ended up strutting downstairs to get / make a quick snack for me. 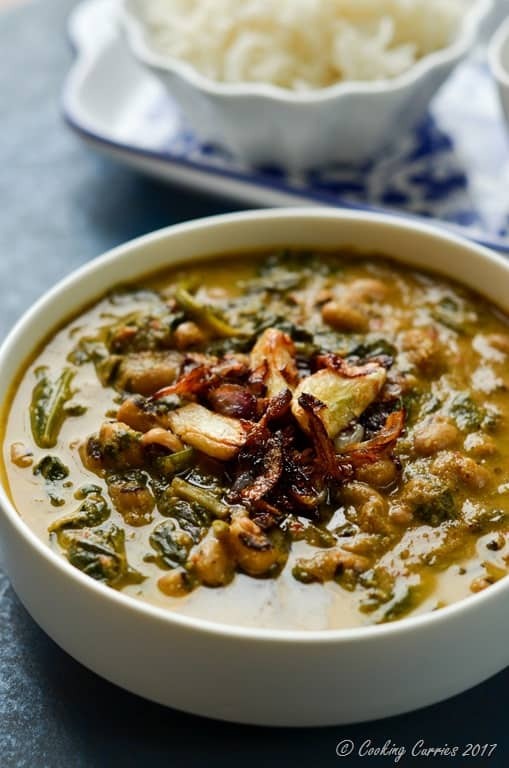 This recipe is inspired by an Instagram account that I follow – @namrathakumar29, a foodie who posts about what she cooks for herself and her family. 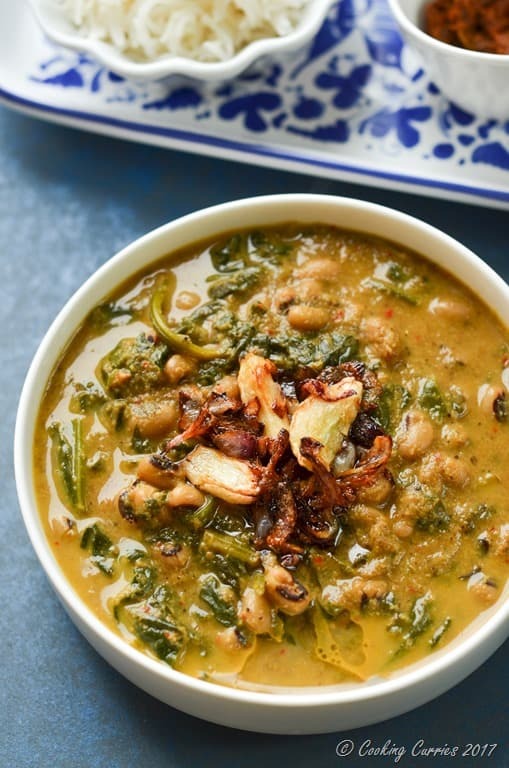 I saw her post about this Spinach and Black Eyed Peas Curry on a particularly cold and rainy January day and all I wanted to eat that day was this! Of course, there was no recipe and I couldn’t wait till she would respond to me, if I asked her for the recipe. So, I set out to search on the interwebs for ingredients and directions to make this. As with any recipe, especially an Indian regional recipe, I found 500 different ways to make this dish! Phew!! Out of those, were a few blog that I knew of and trusted them for a good recipe but even then, they were all so very different. I read through them all and finally picked all the elements to this curry that called out to me and made my own version of it. Now as I write about it, I want to make it again and relish every bit of it all over again. Let me tell you this much – those fried smashed garlic pieces!! Oh my!! To die for! Seriously. And some more recipes with other greens! Cook the black eyed peas with enough water, till it is soft and cooked through. Dry roast the ingredients under “dry roast and grind to a powder” over low to medium heat, constantly stirring them, for 2-3 minutes. Let them cool down. Grind them to a coarse powder in a food processor. In the same pan, add the coconut, garlic and chopped onions and sauté till the coconut turns color ever so slightly and leaves out all the moisture and the onions have become translucent. Remove from heat. Once cool, add it to the food processor with the powdered spice, add tamarind a a few tablespoons of water and grind to a coarse paste. Bring this paste back to the pan and add a little more water to make it a thick sauce of sorts. Over medium high heat, add the spinach and the cooked black eyed peas along with the water. Add salt and turmeric powder and some more water if needed and bring it to a boil. Meanwhile in a “tadka pan” heat the oil for tempered seasoning and add the garlic and pearl onions to it. Once they are nice and golden in color, add this on top of the curry. Mix well and serve with rice or rotis. This looks like such a hearty, warming soup! 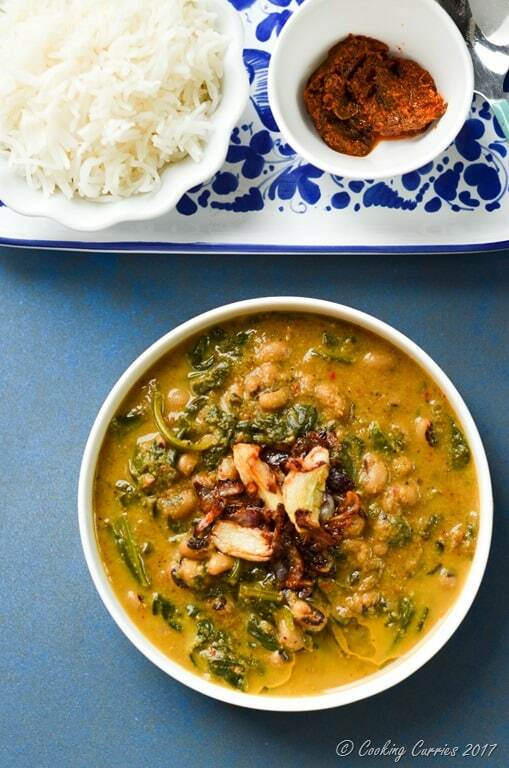 Love curries – This looks SO good! Thank you! 😊 glad you liked it! Being from the south, I love black-eyed peas. I make them ever New Years. I think I am going to try this version this year. It sounds delicious. Yay! Let me know how you like it! Ive gotta check out your black eyed peas version, assuming its on your blog?